I was on my way back to California for the Sierra Challenge, having spent the past few weeks in Southwestern Colorado. I had more than 1,000mi of driving across the Great Basin in brutal summer heat, convinced that air-conditioning is one of the key pillars of modern civilization. I needed to find a high elevation place to sleep on the way across Utah, not too far from my driving route along I-70 and US50, and of course something worthwhile to climb the next morning. In pursuit of this, I'd spent the night at the Little Creek CG (primative/free) near the end of the driveable (by low-clearance vehicles) portion of Oak Creek Canyon Rd in the Canyon Mountains at 6,800ft. 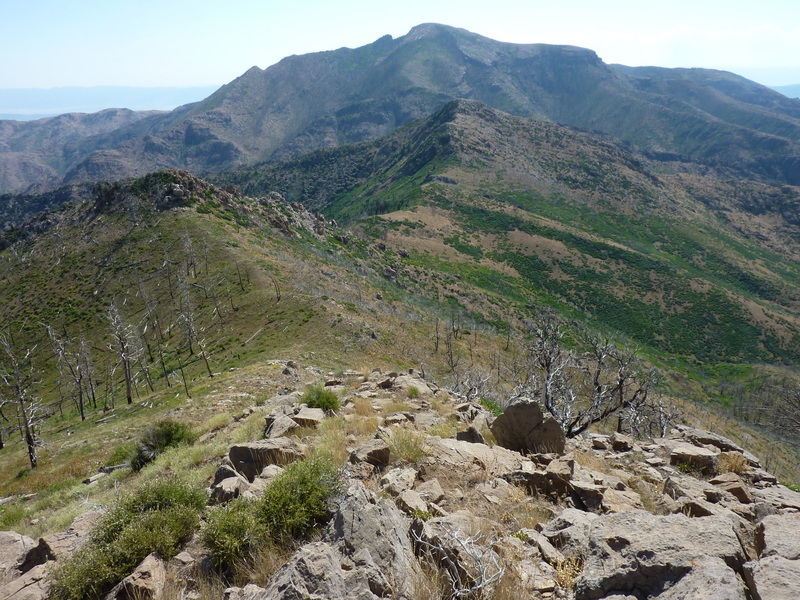 Part of the Fishlake National Forest, the range highpoint is Fool Creek Peak, a P2K and on the Great Basin Peaklist. The standard outing isn't too hard, less than 4mi one-way and around 3,000ft of gain. I added in a few bonus peaks and made a loop of it to beef up the stats some, taking less than six hours for the fun excursion. Temperatures were quite pleasant for most of the morning, though things were getting a bit warm by the time I finished up. After waking and breakfasting around 6a, I moved the car back down the road to the TH and started up North Walker Canyon about 40min later. The route starts out as a rough dirt road, becoming a motorcycle track and then an overgrown trail over the course of the first mile and a half. Some ducks and pink flagging helped me find my way, but I still managed to lose the trail in a few places as I worked to follow it up the drainage. I reached the saddle at the north end of the drainage by 8a, then turned right to follow the continuing use trail up Fool Creek Peak's West Ridge. The 2012 Clay Springs Fire had swept through the area leaving most of the trees burned and lifeless. Though there were almost no living trees left over many square miles, the undergrowth was coming back strongly. I reached the 9,700-foot summit at 8:30a, finding a squat, steel survey tower and a not-so-old register in a glass jar. To the east the summit overlooks the impressive drop to Cow Canyon which makes Fool Creek Peak look like a real mountain. I next turned my attention west to Buck Peak, an unassuming summit some 1,000ft lower than Fool Creek. After returning to the saddle I had ascended, I continued southwest around Pt. 8,605ft and then lower to the major saddle with Buck Peak at 8,157ft. A little-used trail can be found between the two saddles, which is also shown on the 7.5' topo. From this lower saddle, the topo shows routes going north and south down either side, the latter probably the original trail to Fool Creek before it was shortened some. West of this point there is no trail but the cross-country is not difficult and without heavy brush to contend with thanks to the fire. I reached Buck's summit shortly before 10a, about an hour and a quarter after leaving Fool Creek Peak. The top features a small rock cairn and a faded register with only a few entries since it was placed in 2009. About a mile west and 150ft higher is unnamed Peak 8,763ft with a drop of 450ft to a saddle, and it was here I headed next. The traverse took 45min through continuing easy cross-country. Finding no register, I turned south for the return. It would probably have been easiest to drop SE into Knoll Hollow and return to the trail/road system I'd used earlier, but I was enjoying the views the ridges afforded and decided to continue south along the western edge of the North Walker Canyon drainage. Up and over a number of intermediate bumps, the route gradually descends over the course of 2.5mi, curving southeast near the end to bring me back almost to my starting point. At the bottom I had to cross a dry creek with some moderate brush to get back up to the where the van was parked, finishing up by 12:30p.